The Lighthouse of Alexandria (Pharos) was a tower built in the third century B.C.E. (between 285 and 247 B.C.E.) 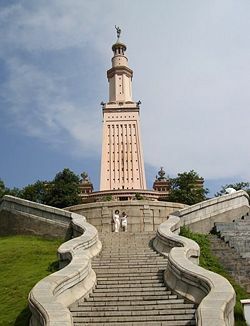 on the island of Pharos in Alexandria, Egypt to serve as that port's landmark, and later, its lighthouse. Alexandria was a thriving Greco-Roman city situated on Egypt's Mediterranean coast. Founded by Alexander the Great, it was home to a significant number of Greeks and Jews. It was renowned throughout the ancient world as an international center of culture and learning. Widely known for its lighthouse and library, Egypt's capital was transferred from Memphis, ancient seat of the pharaohs, to Alexandria in 320 B.C.E. Located in the harbor of Alexandria, the most famous lighthouse in antiquity was a technological masterpiece of the age and a model for all future lighthouses. Also known as the Pharos, it had a height estimated at between 383 to 440 feet and was among the tallest man-made structures on Earth for many centuries. Ancient writers identified it as one of the Seven Wonders of the World. At the time, only the Great Pyramid of Giza would have been a taller man-made structure. In front of Egypt; Pharos is what men call it. Pharos was a small island just off the coast of Alexandria. It was linked to the mainland by a man-made connection called the Heptastadion, which thus formed one side of the city's harbor. Since the Egyptian coast is very flat and lacking any kind of landmark used for navigation, a marker of some sort at the mouth of the harbor was deemed necessary—a function the Pharos was initially designed to serve. Use of the building as a lighthouse, with a fire and reflective mirrors at the top, is thought to date to around the first century C.E., during the Roman period. Prior to that time the Pharos served solely as a navigational landmark. Some descriptions report that the Pharos was surmounted by a huge statue, possibly representing either Alexander the Great or Ptolemy I Soter in the form of the sun god Helios. The Pharos did not appear in any list of 'wonders' until the sixth century C.E. (the earliest list gives the walls of Babylon instead). Pharos became the etymological origin of the word for 'lighthouse' in many Romance languages, such as French (phare), Italian (faro), Portuguese (farol), Spanish (faro), Romanian (far), and Greek (φάρος). The initial building was designed by Sostratus of Cnidus (or Knidos) in the third century B.C.E., after having been initiated by Ptolemy I of Egypt, Egypt's first Hellenistic ruler and a general of Alexander the Great. After Alexander died unexpectedly at age 33, Ptolemy made himself king in 305 B.C.E. and ordered the construction of the Pharos shortly thereafter. The building was finished during the reign of his son, Ptolemy Philadelphos. According to legend, Sostratus was forbidden by Ptolemy from putting his name on his work. But the architect left the following inscription on the base's walls nonetheless: "Sostratus, the son of Dexiphanes, the Cnidian, dedicated (or erected) this to the Saviour Gods, on behalf of those who sail the seas." These words were hidden under a layer of plaster, on top of which was chiseled another inscription honoring Ptolemy as builder of the Pharos. After centuries the plaster wore away, revealing the name of Sostratus. Legend tells of the light from the Pharos being used to burn enemy ships before they could reach shore; this is unlikely due to the relatively poor quality of optics and reflective technology in the period during which the building existed. Only slightly less impressive—and probably more accurate—is the claim that the light from the lighthouse could be seen up to 35 miles from shore. Constructed from large blocks of light-colored stone, the tower was made up of three stages: a lower square section with a central core, a middle octagonal section, and, at the top, a circular section. At its apex was positioned a mirror which reflected sunlight during the day; a fire was lit at night. Extant Roman coins struck by the Alexandrian mint show that a statue of a triton was positioned on each of the building's four corners. A statue of Poseidon stood atop the tower during the Roman period. The Pharos' walls were strengthened in order to withstand the pounding of the waves through the use of molten lead to hold its masonry together, and possibly as a result, the building survived the longest of the Seven Wonders—with the sole exception of the Great Pyramid of Giza. It was still standing when the Muslim traveler Ibn Jubayr visited the city in 1183. He said of it that: "Description of it falls short, the eyes fail to comprehend it, and words are inadequate, so vast is the spectacle." In his time there was a mosque located on the building's top instead of a beacon, reportedly built by sultan Ahmed ibn Touloun. The tower was severely damaged by two earthquakes in 1303 and 1323, to the extent that the Arab traveler Ibn Battuta reported not being able to enter the ruin. Even the stubby remnant disappeared in 1477, when the then-Sultan of Egypt, Qaitbay, built a medieval fort on the former location of the building, using some of the fallen stone. The remnants of the Pharos that were incorporated into the walls of Fort Qaitbey are clearly visible due to their excessive size in comparison to surrounding masonry. Reverse of a Roman coin featuring the lighthouse from 189 C.E. In 1994, archaeologist Jean-Yves Emperor, founder of the Center for Alexandrian Studies, discovered hundreds of huge masonry blocks in the water off Pharos Island. The Egyptian government had asked him to do an underwater exploration of the area before a concrete breakwater was erected. Emperor's mapping of the area suggested at least some of these blocks may have fallen into the sea when an earthquake destroyed the lighthouse in the 1300s. Additionally, a number of statues were found, including a huge statue of a king dating to the third century B.C.E., considered to be a representation of a deified Ptolemy II. Another statue, a companion piece of a queen as Isis, representing Ptolemy's wife, Arsinoe, was discovered in the vicinity in the 1960s. These two statues may have been placed just below the lighthouse proper, overlooking the harbor entrance. Due to these remarkable finds, the Egyptian government canceled its breakwater plans, deciding instead to establish an underwater park where divers could view the many statues, stone sphinxes, and lighthouse remains. Today, the park is open to divers who are at least 18 years of age. More of the remains have subsequently been revealed by satellite imaging. The PBS NOVA on-line program chronicles the underwater discovery of the fabled Pharos lighthouse. The Lighthouse of Alexandria The Seven Wonders of the Ancient World. NOVA Online - Treasures of the Sunken City. PBS. The Great Lighthouse at Alexandria The Museum of Unnatural Mystery. 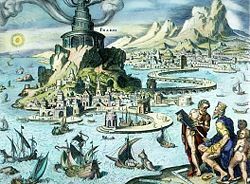 History of "Lighthouse of Alexandria"
This page was last modified on 6 July 2018, at 16:39.